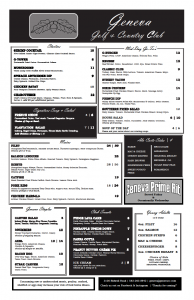 Our menu changes quarterly and always offer a variety sure to please any guest. We strive to provide an exceptional dining experience, and use quality product for all of our scratch-made dishes. Our beef and pork are raised right here in the Midwest, our fish flown in fresh every week, and we have developed a great relationship with local farmers to procure the freshest produce during the Iowa growing seasons. Our Chef Features menu changes every week and offers many brand new dishes, while our quarterly menus offer the favorite dishes of our members. Our menu is available during all dining room hours of operation and offers hand cut Black Angus steaks, fresh seafood, pasta, and small plates designed for sharing. Click on the link below to view the menu.